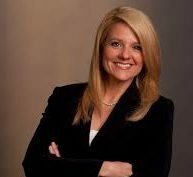 SpaceX’s president/COO Gwynn Shotwell has been named Satellite Executive of the Year at the Washington Satellite 2018 show in Washington DC. In an extensive pre-show interview in Via Satellite magazine she explained how – the usually smiling Shotwell – had to fight back from some disappointing set-backs at SpaceX, not least the total loss of the Amos-6 satellite in an expensive and worrying pad explosion back in 2016. Shotwell has brought the SpaceX team back to unprecedented success in the industry, winning new clients and – probably – curbing some of her boss Elon Musk’s more ambitious statements. She explains how 18 successful launches last year as well as repairing and improving its two launch pads at Cape Canaveral were also key to what is now a fast-improve cadence of launches. She says that this year will see about half of all of the SpaceX launches happen on ‘pre-flown’ (“flight proven”) rockets, and she is anticipating a 50 per cent increase in launch rate (to around 26-30 flights). SpaceX back in business during November?